I have lots of bubble gum pinks to choose from, this is a great color to add to the challenge. Beautiful! Love all those pinks! What a delightful scrappy star, Ellen! 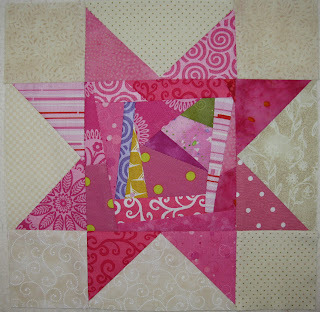 I especially like the polka dots ~ and most of all the one with lime. Nice little punch of color. I love all the different shades of pink you've pulled! They play off each other so nicely. Perfect. Gotta love all the different fabrics in the star points.